A supply of result cards has been posted to the Nominated League Contact at every club. The addresses used were those we had by the 31st July. Please note there has been a change in the design of cards due to Royal Mail regulations. All cards from previous seasons are now invalid and should be destroyed. Any club which has not received its cards seven days before its first game should contact the admin office for advice. Please do not leave it to the eve of the game. Clubs with more than one team will received separate packages with their cards, please note different leagues have different style of cards due to differing regulations, please do not mix them up! Where appropriate clubs have also been sent a list of registered players. Please check this and ensure the players you plan to use in your opening games are registered, if not get them to complete forms NOW! As you may be aware the RFU is rolling out its new software in August. As part of the process the data from the old system is being moved across to the new one. This means that we currently cannot update any fixtures nor process any registrations. The fixture pages on RFU.com show the fixture changes which were approved by the 16th July. If you have applied for a change and it is not shown currently that is because either a) we received it after the 16th July or b) we are still waiting for your opponents to agree to the change. Registrations will be processed in August as soon as we are able. In the meantime do please keep sending them in, but just be aware there will be a delay. Please DO NOT forget the stamped addressed envelope when sending in your player forms. Following a request from the Somerset RFU an additional two teams have been included in SO3N and the fixtures recalculated. Revised copies have been sent to each club in that league and the files on this website updated. With the league now 13 in number it will no longer be possible to accept free weekend requests for Somerset 3 North. The fixtures for next season have been released. Copies have been sent to the Nominated League Contact (NLC) at each club. They can also be downloaded from this site. Please note the requirement to confirm your NLC as soon as possible. On Friday 16th May representatives of clubs in Cornwall gathered at the St Austell Brewery, home of league sponsors Tribute, for the annual presentation evening. Denis Preece, the chairman of the Cornwall Competitions Committee, and Bert Barber, the chairman of the South West Competitions Committee congratulated the county's teams on their successes during the last season. Read more about Cornwall Winners! All three South West clubs involved in the finals of the RFU Cup Competitions have lifted silverware. Trowbridge were 22-19 victors over Leek in the Intermediate Cup. Longlevens triumphed 23-12 against Rugby Lions in the Senior Vase, while Newent ensured a memorable day for the South West with a 20-13 success over Yarnbury. Despite playing away from home the South West representatives all recorded victories in the semi finals of the RFU Cup Competitions and will now run out at Twickenham in the finals next month. Trowbridge won 19-17 at Guildford and will now play Leek in the Intermediate Cup. Longlevens completed the South West success story with a 39-24 victory at Battersea Ironsides in the Junior Vase. They will now meet Rugby Lions. Congratulations to Lydney who have won National 3 South West with two games to spare. Their 71-17 win over Chippenham put them out of reach of nearest rivals Redingensians, who are now involved with Bracknell in a fight for the play-off place. Lydney have won 22 of their 24 games so far. Their only defeat coming at Old Redcliffians back in September. They also drew with Redingensians at the Old Bath Road ground in January. 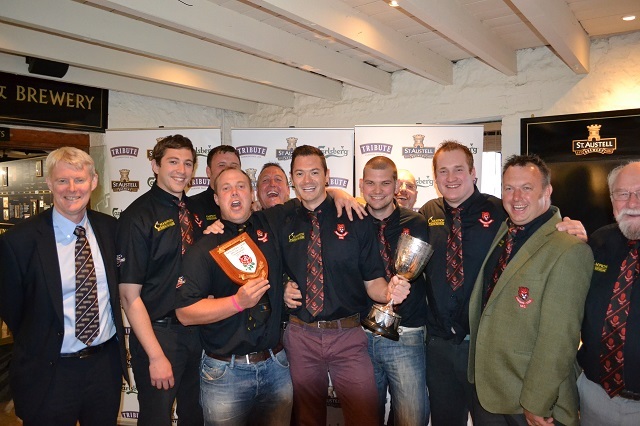 Read more about Lydney are SW champions! The running of the competition relies on clubs reporthing their results as soon as possible after the final whistle. You can text your score to 07797 800102 or by telephone to 01822 678 007. When telephoning the first thing we need to know is the home team, once we have located the game we will ask for the score - ALWAYS give the home team score first regardless of who won. If the score exceeds 20 we will ask you for the number of tries. You must have this information to hand, we cannot afford to hang on the line while you go off to check. Once you are sure we have the score please remember to hang up - each week at least one person forgets and it blocks the lines for other callers. Please do not ask for other scores - again this ties up the lines for other clubs trying to call in. The South West clubs have been drawn away in each competition.